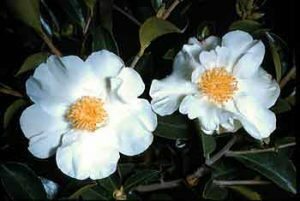 With attractive white flowers Camellia sasanqua Setsugekka is one of the most widely grown sasanqua type camellias of all. This is a sun tolerant camellia that will flower from late summer through to early winter. Reasonably fast growing and with attractive glossy green foliage is can be used in the garden as a stand alone specimen, or as a hedging plant. Like many sasanqua camellias this is an easy care plant, it grows well in Melbourne, Perth Adelaide and Sydney. In the higher elevations of southern Queensland it also thrives. Camellia sasanqua ‘Setsugekka’ is particularly popular as a hedging plant,. It has a naturally upright habit and lends itself to being espaliered as well. It is easy to prune and can be used as a screening plant, even in narrow confines. Fertilise in spring and again in late summer with a specialist camellia and azalea fertiliser. Height – Will reach around 4 metres in height. Width – Will spread to around 1.5 in width. Flowers – Single white with undulating edges on they petals. Flowering period – Late summer to winter. Camellia sasanqua Setsugekka General information. Hedge planting distance – Spacing for a dense hedge spacing should be at 1m. Pruning – Best pruned lightly each year after flowering to maintain a compact bushy habit. Espalier – If you intend to use Camellia sasanqua ‘Setsugekka’ as an espalier, you need to look for one with a slightly lanky or unpruned habit. See if you can find a younger plant that requires less work than older plants to train.